Where you'll find outstanding original Asterix (the Gaul) articles, news, views, videos, and every Latin joke explained. Everything you ever wanted to read about Asterix, Obelix, Dogmatix, and all your favourites. 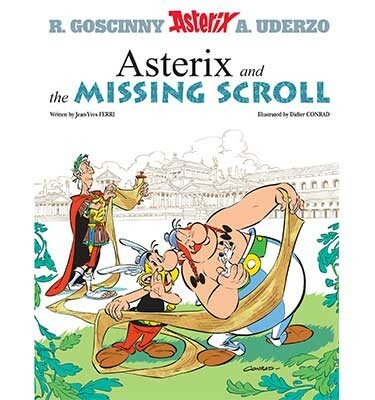 There's also the World Cup of Asterix, where I'm using scientific methodology to whittle the books down to a final two, which will compete for the title 'Best Asterix Comic'. Reading Asterix and the Actress and wondering what Ceterarum Rerum Prudens means? You've come to the right place! The world's greatest Asterix scholar, Professor Ibrox, explains the Latin Jokes in Asterix and Obelix All at Sea. Nunc est Bibendum! Learn the meaning of Dat veniam corvis, vexat censura columbas, and have fun with Roman newspaper names. All the Latin jokes found in Asterix 36 - explained. No need to fish for the meaning of Desinit in piscem mulier formosa superne, we've got it here. Don't be a loser, learn about Gloria victis! And perish the thought you should die without ever learning what Qualis artifex pereo means. Everyone loves cameos. There's nothing that adds spice to a movie like a good 'Hey, was that John Malkovich?' moment. Asterix is full of these special guest appearances - we count down the best 24. Isn't Asterix just a rip-off of Tintin? Here are 9 reasons the answer is 'oui'. Our quest to find the best Asterix comic. There's only one way to decide which is the best Asterix book - a series of head-to-head matches where only the strongest survive. Comics continue to defeat each other until there is only one left standing. THIS IS the World Cup of Asterix. Who should win? Who WILL win? Join us! It's back! The search for the best Asterix book... continues. I compare Obelix and Co., Great Crossing, Switzerland, and Mansions of the Gods. There can be only one! It's back! The search for the best Asterix book... continues. I review Chieftain’s Shield, Gladiator, Roman Agent, and Banquet. There can be only one! It's back! The search for the best Asterix book... continues. A 4-way tie between the best of the early books including fan faves Britain and Legionary. You like Asterix, and you want to buy some attractive merch. This is the page you're looking for.